Coffee from our new machine, a photo by PhylB on Flickr. 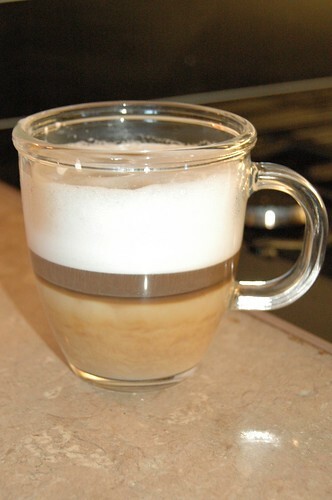 For the first time ever today, I decided to make cappuccino in a transparent cup rather than a china one and now I am desperate for a whole set of glass coffee cups! It looks so cool! It reminded me of a trip about five years ago... As our first holiday, Thomas and I went on a long weekend to Latvia, where they had the cheapest and best coffee I had ever tasted. They added all sorts of wonderful, coloured flavourings to them which just made for a photographic delight!